We really enjoyed speaking to Thomas Rogers this week. Tom is a Head of History, classroom teacher of 10 years, columnist for the TES and course curator for Udemy. 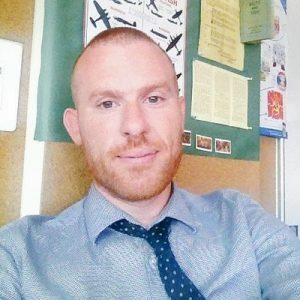 He teaches in an International School in Northern Spain and was first encouraged to go into teaching by his experiences working for Cam America. He has ended up after 10 years of teaching at an English School in Spain via two comprehensive schools in England. His writing for the Times Education Supplement began in 2015 when he had decided to quit teaching. His first blog post on his own website was picked up by the TES who asked if they could publish it. He was asked to write more articles and hasn’t stopped since. What are the benefits of teaching history to young people? Tom believes the benefits are ‘endless’. The lessons of the past are there in everything history teachers do. For example, the current conflicts in North and South Korea, between Israelis and Palestinians or even looking at modern Germany all help students to understand the context of what is going on today. It helps them to understand why nations and the people within those nations make the decisions they do today. How do you go about making history as interesting as possible for your students? Tom says that if history teachers can build up their own subject knowledge sufficiently, they can present information which students were completely unaware of and can engage powerfully. Certain periods of history will also spark interest but all of this relies on how lessons are structured, just like in any subject. However, Tom believes it’s mostly about having a passion and love for the subject. How do you manage the climate around social and political views in your classroom? Tom believes it’s about freedom of speech, first and foremost. He tries to create a safe environment where every student is safe to express what they really feel. In his class, Tom talks a lot about propaganda and how news can be manipulated. He points out the problems around tacking subjects such as ‘Fake News’ – he asks, ‘Fake to who?’ Why are people saying something is Fake News, what is their motivation? The difference between fact ans opinion is very important to get across to a class. Why do you think the issue of support for teachers who wan to remain in the classroom need highlighting? We should be rewarding people who want to stay in the classroom and making it clear that what they are doing is just as valuable as what the Assistant Head in the school is doing. Tom believes there should be a national progression route for teachers who want to stay in the classroom. What are the main differences between working in an international school and a school in the UK? Tom predicts the current trend for teachers to move to international schools will only increase in the next few years.